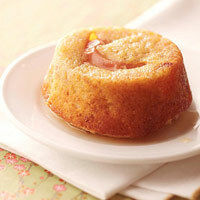 You can serve this lemony muffin-like cake recipe for dessert or brunch. 1. Preheat oven to 400 degrees F. Lightly coat six 3 1/4- to 3 1/2-inch muffin cups with nonstick cooking spray. Set aside. 2. In a large bowl, combine cornmeal, flour, sugar, lemon peel, baking powder, baking soda, and salt; set aside. In a medium bowl, combine buttermilk, shredded apple, egg whites, and figs. Add apple mixture all at once to cornmeal mixture. Stir just until moistened. Set aside. 3. Core whole apple. Cut whole apple horizontally into six rings, each about 1/4 inch thick. Place one ring in each muffin cup, cutting slices to fit if necessary. Spoon cornmeal batter evenly into muffin cups atop apple slices, filling each about half full. 4. Bake for 15 to 20 minutes or until tops are golden brown and a toothpick inserted into tops of cakes comes out clean. 5. Meanwhile, in a small saucepan, bring apple juice to boiling; reduce heat. Boil gently, uncovered, for 7 to 9 minutes or until reduced to 1/3 cup. 6. Let cakes cool in muffin cups on a wire rack for 10 minutes. Run a thin metal spatula around edges of cakes to loosen from sides of muffin cups. Invert pan onto a baking sheet or rectangular tray; remove pan. While hot, slowly drizzle cakes with apple juice reduction. Transfer to a serving platter. Serve warm. Makes 6 cupcakes. **Test Kitchen Tip: To make 2/3 cup sour milk, place 2 teaspoons lemon juice or vinegar in a glass measuring cup. Add enough fat-free milk to make 2/3 cup total liquid; stir. Let mixture stand for 5 minutes before using. *Sugar Substitutes: Choose from Splenda® Granular, Equal® Spoonful or packets, or Sweet 'N Low® Bulk or packets. Follow package directions to use product amount equivalent to 2 tablespoons sugar. PER SERVING WITH SUBSTITUTE: same as above, except 124 cal., 27 g carbo.